This is an exciting week in your pregnancy as you reach the half way mark!! By 20 weeks of pregnancy you will most likely be sporting a noticeable baby bump and looking pregnant. Your uterus will have reached your belly button and growth will be very regular from this point. You may start to think more about the birth and labour at this stage as you now have approximately 20 weeks to go. Some women may go into labour prematurely or some may be late, with most pregnancies lasting anywhere from 37 to 42 weeks. There are a number of factors that can affect the length of your pregnancy. Your health and the health of your baby, accuracy of your due date and your genetics can determine if you are early or late. By 37 weeks of your pregnancy it is best to have completed your antenatal classes, as you will be considered full-term and could go into labour at any time. Whether you are a first-time parent or you would like a refresher, there are many benefits for both mum and dad to attend antenatal classes. These childbirth education classes can help prepare you for labour and the different possible deliveries you may require. Not all births are straight forward, and depending on your birthing plan can vary significantly. Your pregnancy and the baby’s growth after 20 weeks can be tracked by measuring your fundal height. This height is the measurement from your pubic symphysis to the top of your uterus known as the fundus. After 32 weeks the fundal height measurement is uncertain and is no longer accurate to determine the baby’s gestational age. Ultrasound examinations are used in these later stages of pregnancy to determine the size and development of your baby. The size of your baby can correlate with your due date. If the baby is larger than normal you may go into labour sooner than expected. A typical baby will weight approximately 7 pounds (3.2 kgs) when born, where premature babies are smaller as they would have been still growing in the womb. 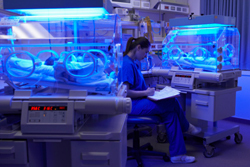 While a baby can survive outside the womb with specialized intensive care in a neonatal unit from 24 weeks, babies grow very rapidly while in the womb and of course have a higher rate of survival the longer they are able to stay inside the womb to develop. Up until 19 weeks of pregnancy your baby grows very rapidly, at 20 weeks of pregnancy your baby’s growth rate will slow down apart from his/her weight gain. Your baby will be steadily gaining weight and measure approximately 16cms from crown to rump. At 20 weeks, the baby’s lungs and digestive system are developing although are not fully formed at this stage. Your baby is however practicing breathing and swallowing, taking in amniotic fluid on a regular basis. As discussed in week 19 your baby’s skin is covered in vernix caseosa to protect the skin from the amniotic fluid and helps to ease delivery of the baby. The skin’s surface has four layers and contains ridges on your baby’s palms and feet; later a unique set of fingerprints will develop. The baby’s body is also covered in a very fine hair at this stage of the pregnancy and is referred to as lanugo. The purpose of this lanugo is unknown however it could be to help regulate and keep up the baby’s body temperature or even hold the protective vernix in place on the skin. To make body heat your baby needs a specialised fatty tissue called brown fat. This brown fat begins to form during the fourth month and helps to keep up the baby’s body temperature. The brown fat deposits build up on the baby’s body, in particular around the neck, chest and crotch. 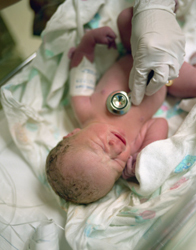 Premature babies are more vulnerable as they have not had enough time in the womb to build up this brown fat that continues to develop until term. Without the brown fat on their body they struggle to keep themselves warm and are assisted by being cared for in a neonatal unit, receiving the extra care they need.